An exhibit of about ten different pieces done in hammered and shaped copper – whimsical, touching and graceful – all functional as weathervanes. Years ago I went to a sculpture exhibit at the Forest Hills Cemetery in Jamaica Plain that included a large work of Somerville sculptor John Field that depicted an angel figure lifting a human form. A tribute to someone who had died of AIDS, this was a work of enormous grace and power. The balance between the hovering angel and the earthbound human form was intense and palpable. Expansive and all-white, it conveyed an amazing combined sense of poignancy, loss and gentle spiritedness in one fell swoop. It was a tour de force. So it was a great pleasure to see this new exhibit of Field’s works. They are smaller and less intense than that earlier work, but demonstrate, in a more quietly humorous way, some of the qualities that radiated so dramatically from that earlier, large piece. They are fabricated using flat copper sheets, hammered over anvils and stakes, so they have a lightness to them that is qualitatively different from bronze castings. And their lightness, obviously, makes them functional as wind vanes. Here, the sense of grace and balance prevails, as it did in the earlier work. Forms are aloft, and off balance in some way, but not adrift. The amazing thing is that they dance above their places of anchoring while remaining bound to them. Whether perched, with legs curled, tilted in a dance gesture, or standing high on a bicycle, these figures achieve a kind of defiantly humorous movement away from their perches. Each piece seems to wink at us as though to say I know I am not moving from this anchor, but let me show you how I can seem to do it. Wave Goodbye (2012) is like a dancing Henry Moore sculpture, abstract, with a head that makes it look a little like Gumby. A waving kerchief accentuates a stance of frivolous abandonment. 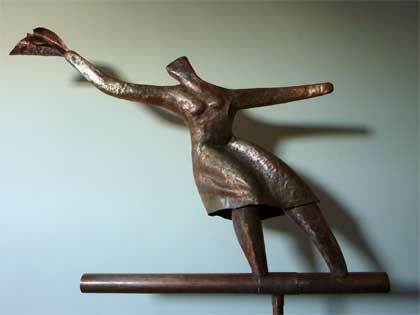 She has no feet, but what the matter, she dances in the wind, leaning back with joy and carefreeness. Pear (2012). 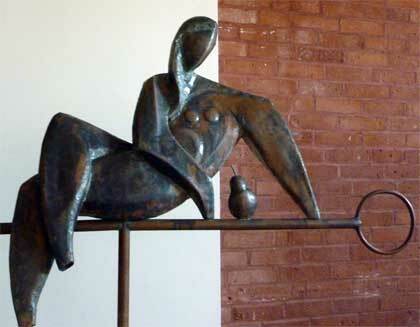 A Picasso Madonna with offset breasts overlooks a teetering pear. Her legs are crossed over the bar on which she perches in a modestly seductive way. Angularity in the arms contrasts with a roundness of the thighs and legs and makes her balance on this large lollipop graceful and sedate. Bicycle Girl (2012). She stands aloft, with her hands on her hips, atop the cross bar of a bike, It leans downhill and seems on a roll, but she is erect and forthright. 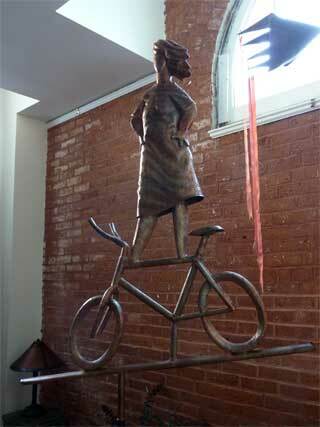 The wheels have no spokes, so the bike travels magically, but this does not faze her. The texturing and reddish burnishing of the copper makes her glow like the late afternoon sun. Indeed, one would literally look up to see these graceful weathervanes. And, seeing them, one would be moved by their gentle and graceful forms to look up in other ways as well.